Prices for Paul Newman Daytonas, as we’ve discussed numerous times, have gotten so stratospheric that they’re beyond the reach of a lot of collectors. They are, of course, also quite rare. There are however a number of highly desirable Daytona models, often with the same reference number, that differ from the Newmans only in the “exotic” details, the most important being the Art Deco style sub-dial numerals. You can save tens of thousands of dollars by purchasing a vintage Daytona that’s just shy of a Newman, but still extremely cool, and possibly a better investment to boot because Newman prices are in something of a bubble. Which brings us to our latest adventure with a piece from the personal collection of Bob’s Watches founder Paul Altieri. 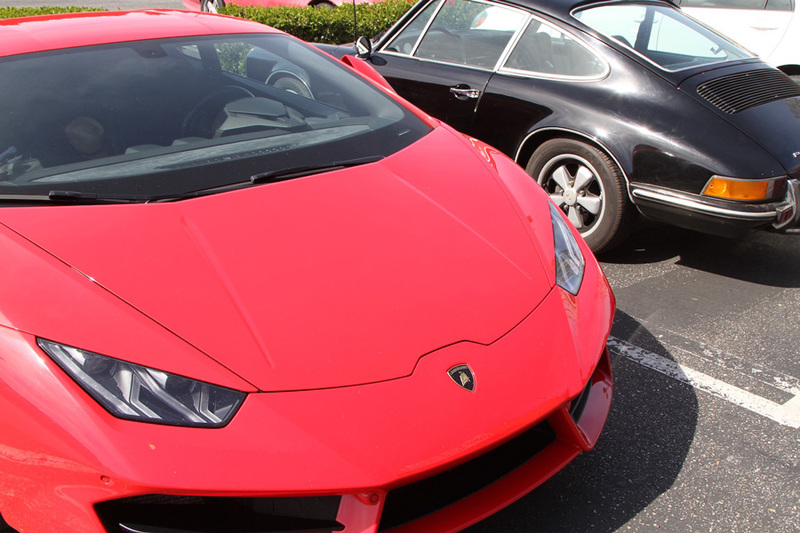 A modern masterpiece from Lamborghini, the Huracan. We’re talking about the collectible Daytona 6263 “Big Red”, one of the most desirable vintage Daytonas in existence, which first debuted in 1967. 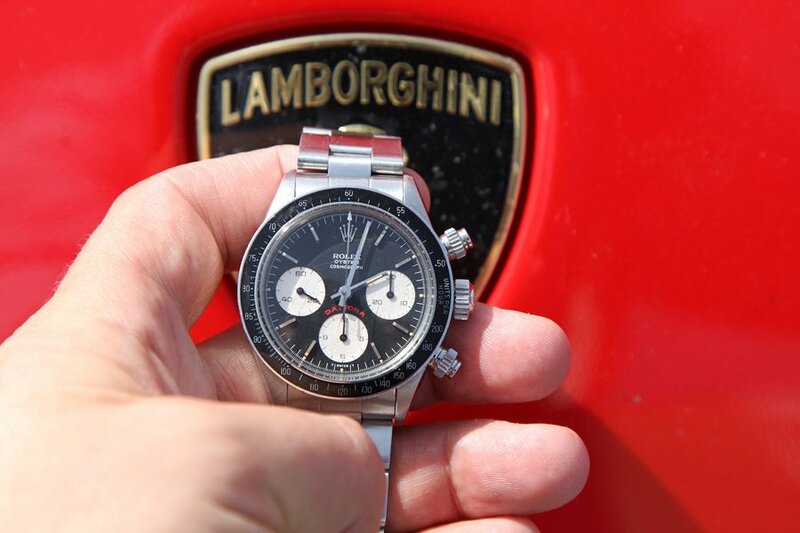 This example features an even more coveted black dial with white sub-dials and of course the iconic “DAYTONA” legend in red which gives this piece its nickname. The 6263 is also equipped with screw-down chronograph pushers, which Rolex introduced in 1965, as well as a waterproof screw-down crown which prompted the addition of the word OYSTER between ROLEX and COSMOGRAPH. The first thing to know about Daytonas of this vintage is that they run quite a bit smaller than modern examples, making them significantly more subtle on the wrist. Despite their high value they are far from flashy. The Daytona 6263 “Big Red” is a collectible timepiece. The same could not be said of the wheels we summoned up for our vintage Daytona road trip. 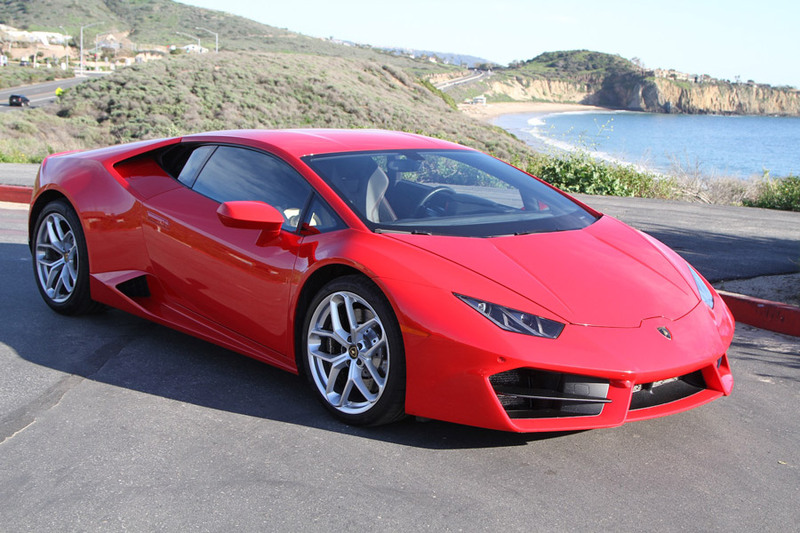 The Lamborghini Huracan is the essence of a modern sports car, and represents a true evolution for the Italian marque. Even such a contemporary looking car is imbued with Lamborghini’s DNA, however, and as such there are certain parallels to be drawn between Rolex’s racy Daytona models and the Lamborghini stable. And for good measure, we asked for the Huracan in hot red – Rosso Mars the company calls it – to match the watch’s signature feature, with black interior. Fully equipped the car runs $220,000 and change, which gets you a V10 engine with 572 hp and all the head-turning Italian style you can handle. Modern or Vintage? That is the question.